LOCATION.--Lat 41°55'13", long 74°34'29" referenced to North American Datum of 1983, Sullivan County, NY, Hydrologic Unit 02040104, on left bank about 50 ft upstream from bridge on County Highway 157 in Claryville. GAGE.--Water-stage recorder and crest-stage gage. 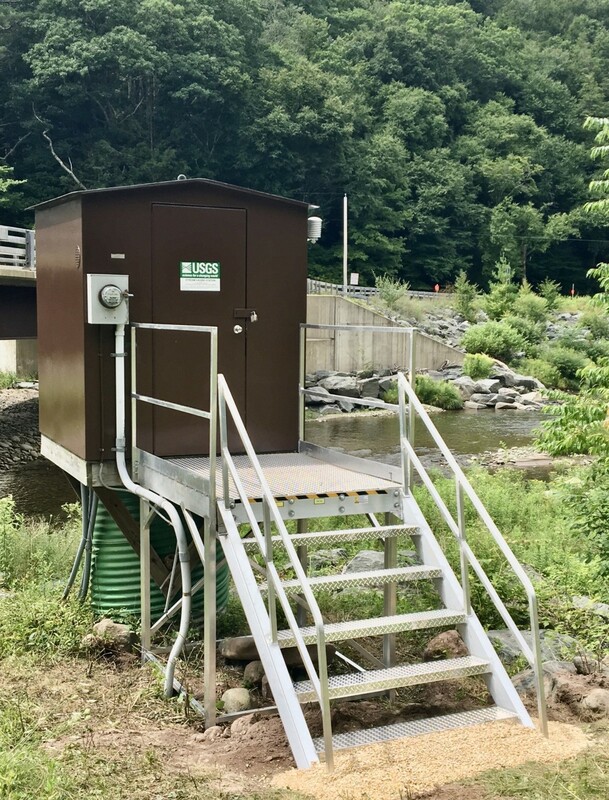 Datum of gage is 1,620.56 ft above NGVD of 1929 (Sullivan County Department of Public Works benchmark) and 1,620.02 ft above NAVD of 1988 (VERTCON). REMARKS.--Diversion upstream from station to maintain lake volume at Frost Valley YMCA camp. Excess lake water is diverted back into the river upstream from station. EXTREMES FOR PERIOD OF RECORD.--Maximum discharge, 11,600 ft³/s, Aug. 28, 2011, gage height, 15.38 ft, from rating curve extended above 3,400 ft³/s on basis of runoff comparisons with nearby stations; minimum discharge, 5.9 ft³/s, result of freezeup, Mar. 14, 1993; minimum gage height, 3.61 ft, Aug. 27, 2005.